Crawley Town topscorer Izale McLeod is about to be sold as the club prepare to cash-in on their most valuable asset. He did not feature in their squad for Monday’s night’s excellent 1-0 victory against Championship club Reading. 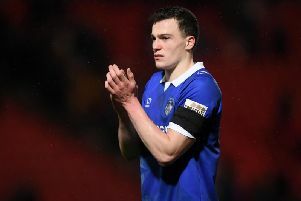 This fuelled speculation he is imminently joining another club, with League One teams Barnsley and Coventry among the candidates thought to be interested. Manager Mark Yates would not shed any light about McLeod’s situation when quizzed about it on Monday night. In the meantime Reds are set to sign a new goalkeeper within the ‘next 24 hours’ according to manager Mark Yates. Yates currently has an injury to right-back Lanre Oyebanjo which will cause the player to miss the start of the season. He is also missing a left-back after Ryan Dickson left to join his hometown club Yeovil Town. Yates was looking at two trialists who played on Monday night, Durrell Berry (ex Arsenal and Cheltenham) and Belgian player Brian Van De Bogaert.